As I come to the end of Kingless Country, I felt inclined to study up on the early 1900s. No spoilers why, but this got me looking at materials for World War One. This reminded me I missed “Valiant Hearts” when it was released last year. 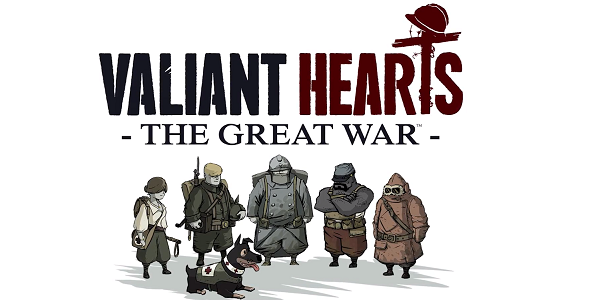 I’m no history buff, but Valiant Hearts carried me on a rollercoaster of emotions. It follows the exploits of four people (and a dog) during one of the darkest times in human history. I’m hesitant to offer up spoilers here but I can use Valiant Hearts as a fine example of a gripping hook. Emile, a Frenchman, is conscripted into the war after the deportation of his German son-in-law, Franz. This is made worse by the fact Emile is a proud new Grandfather. There’s also Freddie, an American soldier (who voluntarily joined the French long before the rest of the USA involved themselves officially), Anna a Belgian nurse (whose scientist father begrudgingly developed weapons for the Germans) and Walt, a German Doberman medical war dog (who aids all four characters despite their alliances). There aren’t too many stories out there that tug on, or rather mercilessly yank on, my heartstrings. I think anyone trying to tap into the magic of a strong hook would do better to give this a look. Hope fully it inspires you to write as it has for me.